The author and poet is best known for books like We're Going On A Bear Hunt and Don't Put Mustard In The Custard. He will hold the position of Children's Laureate for two years and wins a £10,000 bursary. Rosen was chosen by peers in the world of children's literature, and takes over from Jacqueline Wilson. The 61-year-old said: "I see my job as Children's Laureate being an ambassador for fun with books. "I hope that I'll be able to boost all children's reading for pleasure but also to give a special lift to the wonderful diverse world of poetry for children," he added. Tracy Beaker author Wilson has used her two years as laureate to promote reading aloud to children at bedtime. She has also judged the Blue Peter writing competition and opened libraries and hospital reading rooms around the UK. Rosen first started writing poetry at the age of 16 - inspired by DH Lawrence's poem Bat. After school, he went to Oxford University to study medicine before switching to English Language and Literature. During his time in Oxford, he became involved in theatre and wrote a play, Backbone, that was put on at London's Royal Court Theatre. He then spent some time at the BBC, working on Jackanory amongst other programmes, before going to the National Film School. Rosen said he became a children's author "by accident", after publishers told him his first collection of poems, Mind Your Own Business, would be better suited to a young audience. As well as writing, Rosen presents the BBC Radio 4 programme Word Of Mouth, which looks at the English language and how it is used. 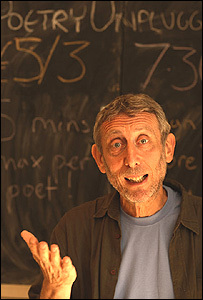 He also travels to schools in the UK and abroad to encourage children to write and read poetry. His award was handed out at a ceremony in London. Previous recipients include Quentin Blake, Anne Fine and Michael Morpurgo.